The different major health problems encountered in day to day life and during the life time of a native have been analysed exhaustively based on detailed Individual case studies. 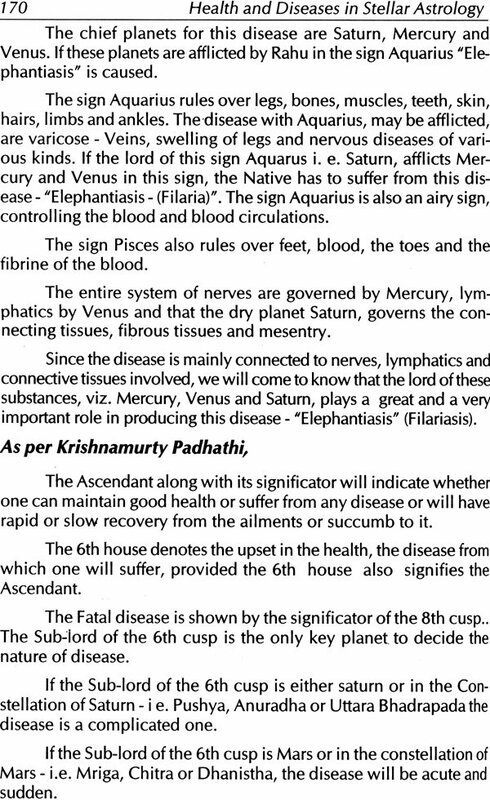 How to analyse the oncoming of the diseases and reasons based on general astrology and Krishnamoorthy Padhathi and the planetary siginificators for each case are well detailed. With the help of the Astrology (Natal as we" as horary), one can pinpoint the disease or ailments and give guidance to the', suffering native, who is always anxious to be free from the ailment concerned as early as possible. This book, will be benefitial In pin pointing the ailments and give guidance to the native concerned. Prof. Krishnamurty has mentioned in his 3rd reader regarding Progressed Horoscope, but nowhere in his any reader is given the procedure of casting of progressed Horoscope. A separate chapter in this book, on "Progression and Progressed Horoscope" the detailed procedure of casting Progressed Horoscope Is given according Krishnamoorthy Padhathi. For the first time. Astrologers will Find this very useful In casting progressed Horoscope as and when required. An essential book for every one interested in detailed understanding of the medical problems encountered by the native. Dr. M. N. Muley, M.B.B.S., a retired Gazetted Medical Officer, Maharashtra State. 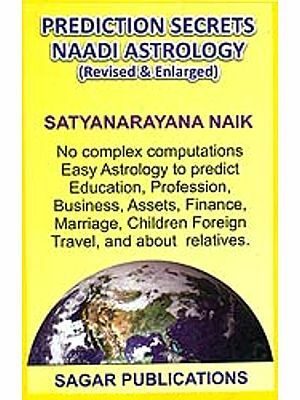 The author is a professional astrologer and is practicing Astrology, especially Stellar Astrology, better known as Krishnamurti Paddhati, advocated by Jothida Mannan, Yotish Martand, Late K.S. Krishnamurty since the year 1993. Also the author of the books, Stellar Astrology, Events in Life published in 2016 and his earlier book on Medical Astrology-titled "Astrological Revelations of diseases" published in the year 2007. Both based on Krishnamurthi Paddhathi, got a thumping response from Astrologers everywhere as well as from the Medical professionals and public in general. It gives me pleasure to write foreword to Dr. Muley's Book on "Heath and Diseases in Stellar Astrology and Health problems". This book is based on Krishnamurthi Paddhati, as has been stated under the name of the book. Dr. M. N. Muley is an M.B.B.s., who was a Medical Officer in Government Service. Having deep interest in Astrology - particularly K.P. System. The doctor with the help and guidance of jotish Ratna Shri Udaya Damodhar Bapat - studied Krishnamurty Paddhati, in every detail, and acquired - "Nakshatra jotish Ratna"(K.P. Sysem)- the qualification of repute. He is honoured with the title of "jotish Alankar" by the world Astrological Research institute and "jotish Kausthubh" by the Krishnamurty jotish Vignyan Mandai, Mumbai. The author considers Shri Uday Bapat, as his manas Guru and respectfully dedicates this book to him. The present book is the result of doctor's laborious, research work in "Astro - Medical field." During the past few decades, Krishnamurty Paddhati has become very popular among intellectuals and educated masses. It can be said, K. P. has surpassed "Traditional Astrology" in many ways. 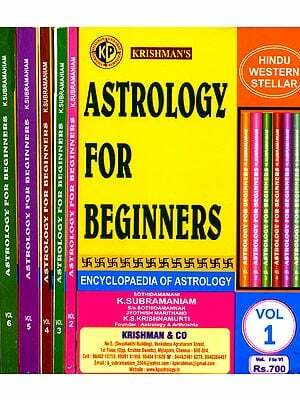 Dr. Muley, although knows about every branch of K. P. Astrology, he has dealt with "Medical Astrology" only, in this book. The earlier part of the book consists of fundamental things of K.P. system such as Sign - their characteristics, Planets, their lordships, constellations and their lords and their signifiers, especially, regarding diseases. To this are added 1 to 249 Sub- Tables for ready reference. Thereafter, planets and their diseases, Significators of houses, diseases of subs are included. This is the technical or theoretical part of the science, which can be found in many of K.P. books. But, considering the latter predictive part, these technicalities are essential to understand the cuspal Natal charts medically and astrologically. The latter predictive part of the book, is Dr. Muley's important and valuable research work worth admiring. Herein, the doctor has mentioned various diseases, which are considered serious, with elaborate description. He has also, shown, how a disease could be diagnosed, with reference to the patients cuspal Natal chart. Dr. Muley has done this work, with amazing skill and absorbing intellect. Being conversant with medical and astrological sciences, the authors' work has a high degree of authenticity. Having full faith in astrological truth, the author, observes "With the help of astrology-one can come to the conclusion or one can predict with confidance - whether a native is likely to suffer from epilepsy or not during lifetime, from the Natal chart." So is with other diseases. It seems that the book is for the advanced students of astrology - K.P. 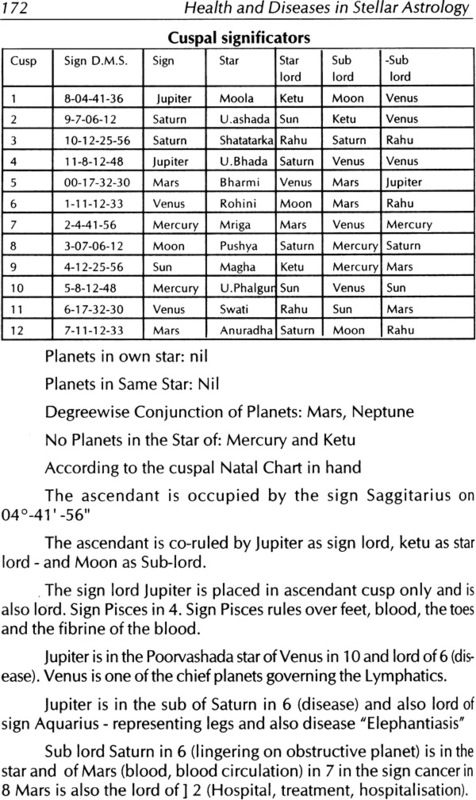 System, but, if one knows, how to erect the cuspal Natal chart and K.P. theory and principles from other sources, the new beginner will also understand it easily. The book has permanent value and permanent interest. 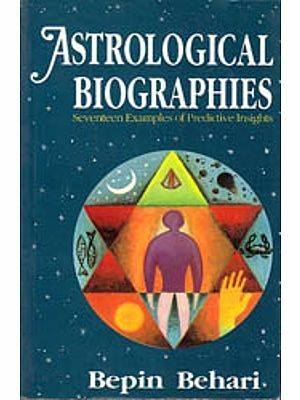 Such type of illustrated books- based on experience, observation, and research are rare in astrological field. 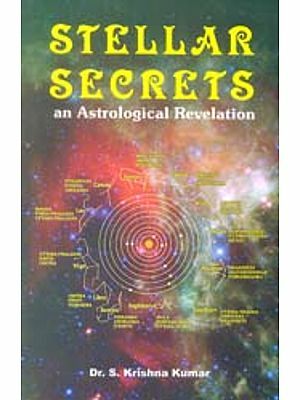 So, I presume that Dr. M. N. Muley's "Health and Diseases in Stella-r Astrology" would be widely and warmly acclaimed by English knowing astrologers, medical profession, and students, who have interest in Astro-medical science. I, heartily, congratulate Dr. M.N. Muley, for writing a good book, which could be used as reference book also. I wish it, success all the time and in every respect. Health is precious. The greatest problem that every human being confront - is how to maintain sound physique. Since the beginning of humanity, human beings have suffered much physically. The changes in life style from time to time have also brought in more and more complicated diseases. Medical system has also improved with passage of time. In ancient times diseases were being diagnosed much before, those could happen with the help of astrology only. A medical practitioner examines the patient, hears all the compliants of his or hers, gets all the required information/ investigations (pathological/Radiological) and then arrives at the final conclusion and diagnosis. I am fully confident and of the firm opinion, that, with the help of the Astrology (Natal as well as horary), one can pinpoint the disease or ailments and give' guidance to the suffering native, who is always anxious to be free from the ailment concerned as early as possible. But, for the astrologer, it is easy to eliminate any of the suspected ones and pitch upon the diseases, correctly with the help of Natal horoscope, even without exaamining the patient and without, any investigation. 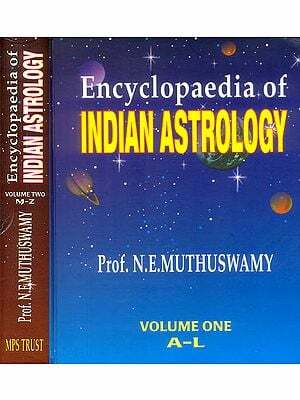 I have made an attempt in this book to collect astrological combinations given in the classical books and also to add to these combinations those applicable to various new diseases according to Krishnamoorthy Padhathi. My main objective in writing this book is to make students of astrology, astrologers, medical profession in particular and public in general aware that it is with the help of astrology also one can pinpoint the disease, from the natal horoscope concerned, without any investigations and that too without the patient in front. With the same view in mind, I have dealt with in this book, astrological indications of the important diseases, like Heart disease, Epilepsy, Cancer, Parkinson disease, Paralysis, Nephritis, Uterine diseases, Asthma, Diabetes, Eye diseases, Leucorrhea, Tuberculosis, Mental diseases, Appendicites, and Leprsoy to name a few. 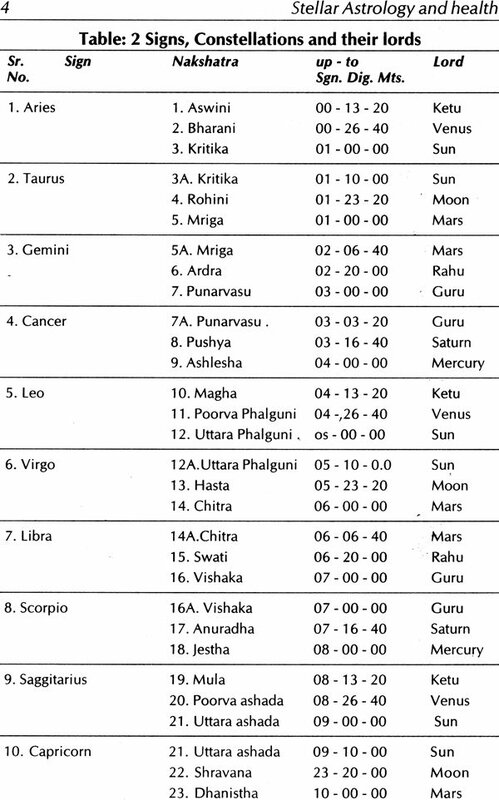 I have discussed astrological indications of the above named diseases elaborately with the help of natal horoscopes using K P table of houses, K P Ephemeris, and K P Ayanamsa for the same. With the help of Krishnamurty Padhathi, one can definitely pnpoint diseases, the native is suffering from and is likely to suffer from in the conjoined period of dasa Bhukti, Antara concerned, 6th house representing the disease, defect and danger, by the 8th and 12th hospitalisation. The Sub lord of the 6th Cusp - is the final deciding factor of the disease - concerned. Planets connected with the 6th house and the ascendant will produce disease, in conjoined periods and dasa, bhukti Anthra tolds. 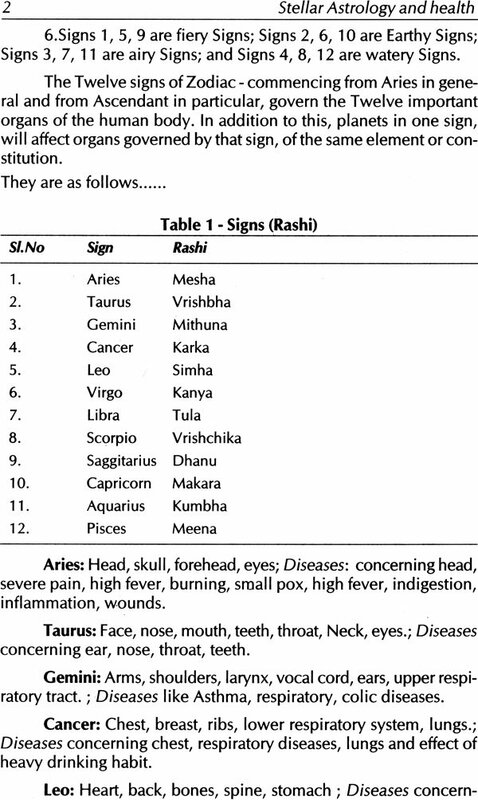 According to Krishnamurty Padhathi, there is a definite link between the Sub lords of the ascendants and the 6th Cusps of ones' horoscopes to the occurrence of disease in the conjoined period of the significators of these two cusps. Thus, the thumb rule is very unique and simple, in pin pointing disease from ones' horoscope. The nature of the disease can be found out, from the Sub-lord of the 6th cusp. Whenever, the sub lord of any house - signifying a part of body - will have some connections with 01 and 06 then only, it can be said, that the person will be suffering from the disease, in that part only. The Karaka planets will signify the disease, and the cuspal portion will indicate the affecting part of the body. The fatal disease is shown by the 8th house and its significations. 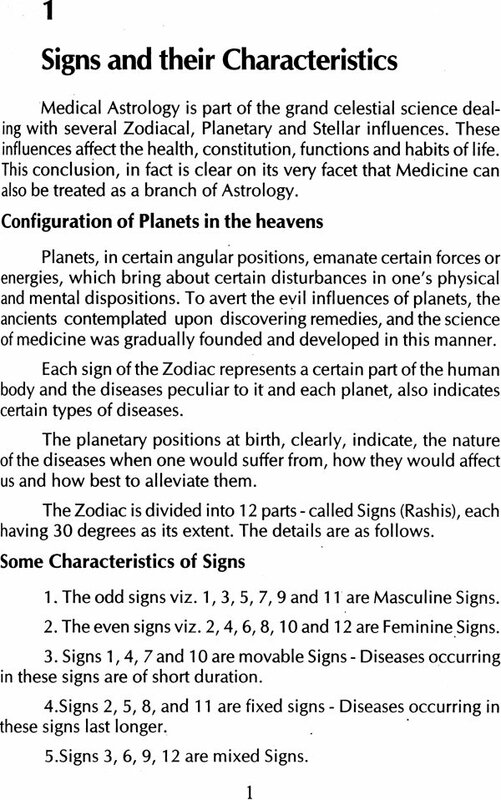 When the planets have some connections with the houses 9,8, 12 they are said to be malefic for health. So, whenever the Sub lord of the 6th cusp is well connected to the houses 6, 8th, 12th, one can boldly predict the disease and the affecting part of the body. 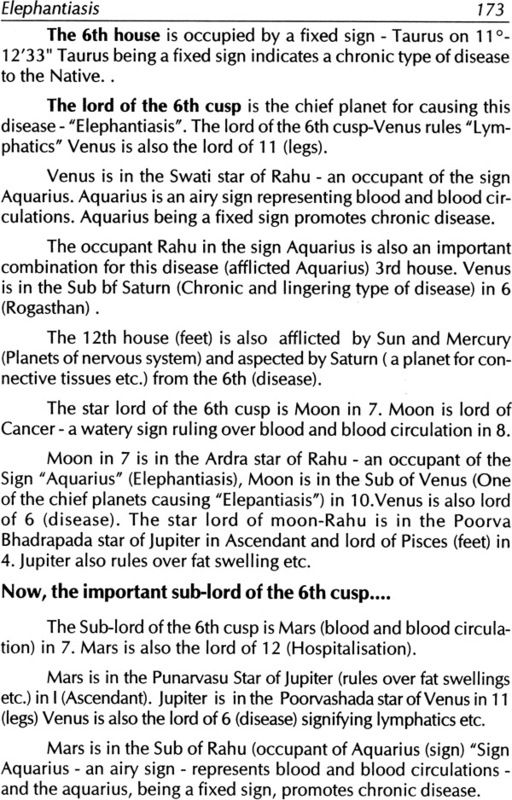 If the sub lord of 6th cusp is Saturn or is in the constellation of Saturn, the disease is chronic and lingering one. If the Sub lord of the 6th Cusp in Mercury, then complication in the disease. 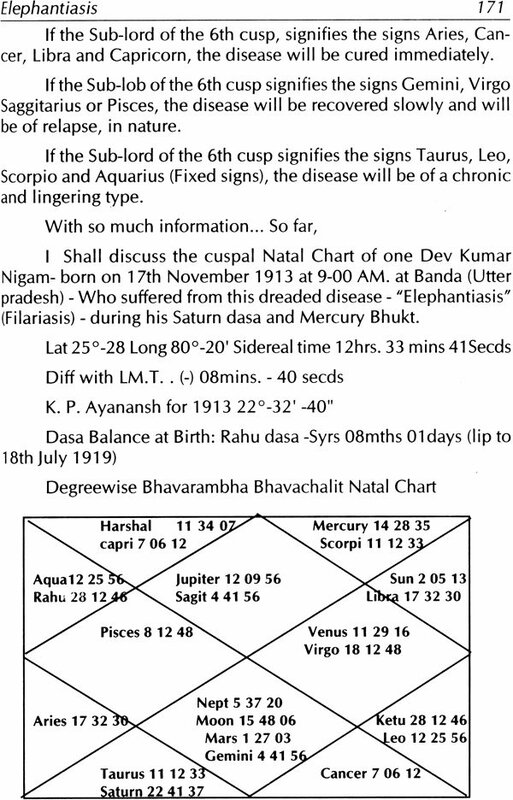 If the Sub lord of the 6th cusp is Mars, then the disease is sudden and acute one. Planets in movable signs - cause disease of short duration. Planets is fixed signs - cause disease of prolonging type, Chronic, loathsome and tedious. 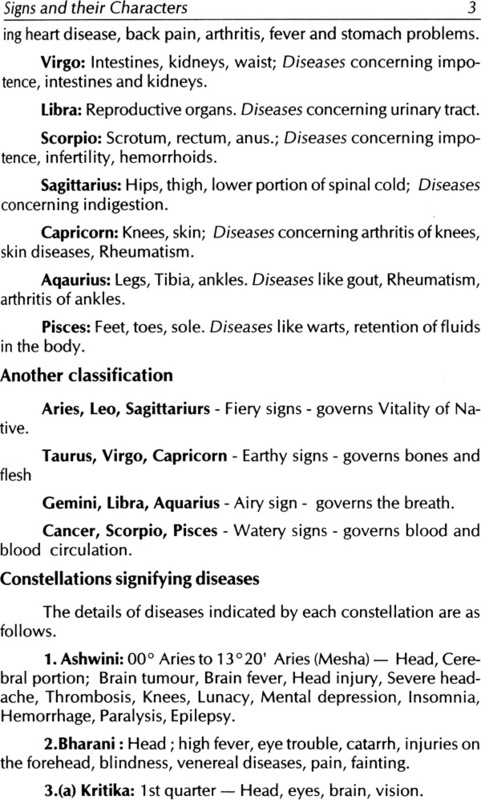 Planets in common sign-cause diseases of short duration but in repulse type. I hope, with the help of this book, any K.P. Astrologer will be benefitted in pin pointing the ailments and give guidance to the native concerned. Prof. Krishnamurty has mentioned in his 3rd reader regarding Progressed Horoscope, but nowhere in his any reader, procedure of casting of progressed Horoscope is detailed. I have given a separate chapter in this book, on "Progression and Progressed Horoscope" wherein I have detailed the procedure of casting Progressed Horoscope - according K.P. for the first time. Astrologers will find this very useful incasting progressed Horoscope as and when required. I would like to express my gratitude, with due respect and many many thanks to Dr. Ramkrushna Joshi, who when approached, wrote foreword to my book willingly and that too within a short period. So also my greatest regard and gratitude with due respect to Shri M. Easwaran, Editor of CBH. Publications, Nagercoil, Tamil Nadu for his courteous behavior and having readily agreed to publish this second book also as early as possible, as with my first book Events in Stellar Astrology. I am also thankful to Shri V.R. Upasani - Astrological practitioner who offered h is valuable help in giving valuable suggestions and guidance, while writing this book, which I can never forget. I shall feel myself fully gratified by the acceptance of this humble effort, If my devoted and sincere efforts are appreciated by astrologers, students of Astrology, Medical Profession and also public in general.